Expanding Medicaid in Utah will give over 107,000 Utahns the access they need to treatment for their substance use disorders (SUDs). Nearly 13% of the newly-eligible Medicaid expansion population suffers from an SUD. By 2020, mental and substance use disorders will surpass all physical diseases as a major cause of disability worldwide. The earlier Utahns receive help, the better the outcomes Utahns have, at less cost, with less likelihood of long-term disabilities (diabetes, cardiovascular problems, cancer, etc.). Despite knowing all these facts, our public substance abuse treatment system only treats about 16% of the current need. Approximately 86,500 Utah adults and youth are in need of (but not receiving) SUD treatment services. Expanding Medicaid to Utahns who suffer from this disease will give them the access they need to receive treatments for their substance use disease. Medicaid expansion could potentially impact all adults below 133% of the federal poverty level (FPL), regardless of disability status. This means that a large number of childless adults would gain access to insurance coverage if we expanded. Plus, nearly 40,500 uninsured Utah adults dealing with an SUD would be eligible for health insurance coverage through the health insurance exchange, new Medicaid expansion program, and the current Medicaid program. Through Medicaid expansion, Utahns with SUDs can use their new insurance to cover the disease management they need, rather than ricochet between multiple acute treatment episodes. - amends the Insurance Code to provide health benefit plan coverage for the treatment of autism spectrum disorder. When Utah Gov. Gary Herbert mentioned during a January 23rd news conference that “Doing nothing is not an option” in reference to the state’s looming Medicaid expansion decision, a lot changed very quickly. But the real story was much more complicated than headlines or map codes. As political veterans recognize, nothing in Utah—from rivers to politics—moves in a straight line. Here are three reasons why Utah’s Medicaid expansion is taking the meandering route. First, not “doing nothing” is both a double negative and different from doing something specific. Media reporters (and many advocates, including UHPP) jumped to the conclusion that Gov. 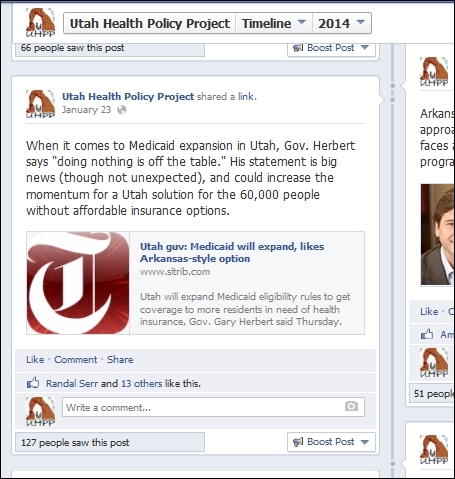 Herbert supported Medicaid expansion in Utah. In fact, he never mentioned the word “Medicaid” in his press conference remarks [Timestamp: 19:50]. Instead, he focused on working with the legislature to help the 60,000 Utahns caught in Utah’s coverage gap. These are primarily adults who earn between 0% and 100% of the federal poverty level—too little to use the ACA marketplace, and too much to receive Medicaid. Covering this population in Utah could involve Medicaid, private insurance, or something entirely different. Second, it’s clear that any viable (ie. 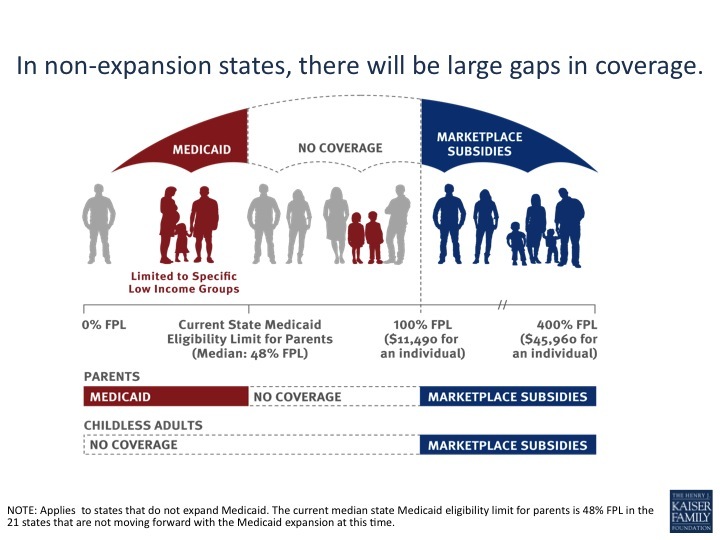 able to pass the Utah legislature) approach to closing Utah’s coverage gap would employ subsidized private insurance, not traditional Medicaid. Plus, many experts predict Utah will push the federal government to be more flexible than the existing private options pioneered by Arkansas and Iowa. This might include a partial expansion model (0 to 100% FPL) that the federal government has said they won’t approve with the sought-after 90% federal funds match rate. For insight on what partial expansion might mean for Utah, we should look to Wisconsin. Last year Gov. Scott Walker turned down the extra federal funding in favor of a partial expansion plan that added some Medicaid recipients, and sent others to the state’s ACA marketplace. Third, the Utah legislature—which opened its 2014 session four days after Gov. Herbert’s press conference—still needed to weigh in on the decision. And they soon did. House Speaker Becky Lockhart (R-Provo) used her opening remarks to say she wouldn’t support a Medicaid expansion plan that depends on federal funding. Since between 100% and 90% of Utah’s expansion cost could be covered by the federal government, it’s prohibitively expensive for Utah to expand using only state funds. Still, some legislators are exploring a state-only funding approach, which would likely cover only a fraction of the 60,000 Utahns caught in the coverage gap. UHPP keeps these three realities in mind as we engage in one-on-one conversations with Utah lawmakers about helping the 60,000 Utahns in the coverage gap. Our goal is to educate them about the private option models that Utah could pursue—and listen to their concerns. In the next issue of Health Matters we’ll share a list of the most effective Talking Points we’ve developed to explain the private option to Utah legislators and policymakers. After the first week of the legislative session we know the road to closing Utah’s coverage gap will be a bumpy one. Despite the thousands of hours of analysis, study and debate conducted by state’s agencies, last summer’s Medicaid workgroup, and legislative committees, there is still no firm consensus on what will happen—or when. The three private options (including doing nothing) are still on the table, along the recently floated option of doing a state-funded solution. Plus, we should learn more about Speaker Lockhart’s coverage gap proposals within the next week. All we do know is that a successful Utah-solution will require collaboration between Gov. Herbert and the legislative leadership. If Utah’s healthcare policy wonks can create a “made in Utah” solution that can thread that needle, it will be the Medicaid expansion model that Utah will pursue. During the next five weeks Gov. Gary Herbert and the 104 members of the Utah Legislature will decide whether to expand Medicaid to more of Utah’s low-income individuals and families. Currently, Utah adults without children are not eligible for Medicaid at any income level, and parents must earn below 50% of the federal poverty limit (FPL). This system leaves about 60,000 Utahns without any affordable options for health insurance. They are caught in the “Medicaid Coverage Gap”—earning too little to receive premium subsidies on healthcare.gov, and too much for Utah Medicaid. If Utah expands Medicaid, it would join 26 states already extending low-cost insurance to more low-income residents, including nearby states like Nevada, Arizona, New Mexico, and Colorado. For most of these states, Medicaid expansion means increasing the scope of traditional Medicaid to cover any individual or family whose yearly income falls between 0-138% FPL—including the working adults and low-income parents not covered in Utah. However, unlike our neighbors, Utah is considering options that would place most of our Medicaid expansion population in private insurance plans. Utah is following the example set by Arkansas and Iowa, two states that pursued private-insurance models in 2013. In both states, the federal Dept. of Health and Human Services (HHS) granted special waivers to allow an expansion using subsidized private insurance. Health policy wonks call this approach the “private option” Medicaid expansion. If Utah pursues a similar private option, the 60,000 Utahns currently caught in the Medicaid coverage gap would receive sliding-scale premium subsidies to purchase private insurance on healthcare.gov. But there are still many details to work out. Plus, it’s unclear if the Utah legislature will support a private option expansion. But if it happens (and even if it doesn’t), here’s what a Utah expansion could look like—and what it would cost Utah taxpayers. •Asset test eliminated for aged, blind, and disabled. UHPP is collecting stories from real Utah residents who are seeking health insurance through Medicaid or healthcare.gov. Why are we looking for these stories? Because they work. One of our key lobbying strategies is to tell Utah legislators real stories from their own constituents. Let’s face it: Health reform is too complicated for most lawmakers to understand. But when they learn about a family caught in Utah’s Medicaid Gap, or a woman undergoing cancer treatment, they can put real names and faces on the issues they must decide. Plus, TV and newspaper reporters contact UHPP when they need to interview Utahns impacted by health reform. Just last week we connected a KSL reporter to a Medicaid Gap coverage story that resulted in this Deseret News article. Over the last few months we’ve helped multiple reporters place first-person stories in their television, radio, and print coverage. Each of these stories can inform tens of thousands of Utahns about the importance of affordable health insurance. If you would like to share your health insurance story, or know someone who might—please contact UHPP’s My Story Team at mystory@healthpolicyproject.org, or call us at 801-433-2299 x8. Kim Gillan, the new director for Region VIII of the U.S. Dept. of Health and Human Services, is making a two-day trip to Utah this week. Region VIII includes Utah, as well as Colorado, Montana, North Dakota, South Dakota, and Wyoming In addition to meeting with lawmakers and other healthcare stakeholders, Kim will be meeting with members of the Utah’s new Health Care Round Table on Wednesday at 1:15pm at the Utah Capitol. Members of the public are invited, but please respect that members of the media are excluded. The Health Care Round Table meets every Wednesday afternoon at 1:15pm in the Olmsted Room at the Utah Capitol. Each week the roundtable will hear from an invited guest. On Wednesday February 12th the roundtable will welcome Rep. Robert Spendlove (R-Sandy), an economist who recently served as Gov. Gary Hebert’s state and federal relations director. Kim is the new Region VIII Director for the U.S. Dept. of Health and Human Services (HHS). Originally from Montana, Kim served 16 years in the Montana state legislature, championing a variety of policy and programs to improve access to health care for people with diabetes and autism, and also small business owners. She also worked with the Montana State University-Billings, focusing on workforce development and training. She is active in several regional organizations for state legislatures. Doyle is the Executive Officer in the Office of the Region VIII, Health and Human Services (HHS). Doyle works with state, local and community groups to answer questions, provide information, and assist with matters relating to the implementation of the Affordable Care Act (ACA). Prior to joining HHS, she was the Director of Public Policy with the Colorado Behavioral Healthcare Council (CBHC), the membership organization representing Colorado’s statewide network of community mental health providers, and has worked with the Colorado state legislature for nearly a decade.